33% glass-filled nylon with pebble-grain surface, provides secure handling in all weather conditions. Furnished with a complete set of adapters and spacers for installation on 12 ga. Mossberg 500, Maverick 88, Remington 870, and Winchester 1200/1300 pump shotguns. Easy to install, requires no modifications to firearm. 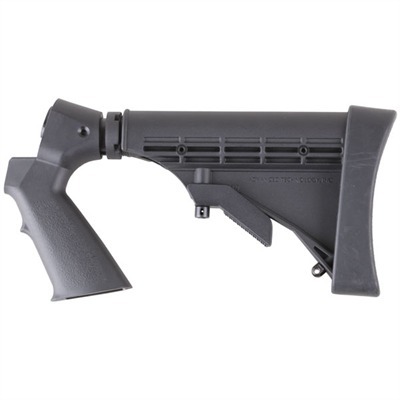 Lightweight, six position stock with a molded pistol grip mounts firmly on your shotgun to provide superior control and comfort in the field or at the range. Installs easily in minutes with no gunsmithing required for a professional looking, smooth fit. Mounts directly on Mossberg 500/590/835 and on Remington 870, Winchester 1200/1300, Norinco 98, and Maverick 88 with the inc Mfg: Advanced Technology SPECS: Molded polymer, matte black. 10 1/2'''' (26.6cm) " 14 1/4'''' (36.2cm) L.O.P. Complete kit includes Shotforce buttstock, adapter tube plug, Remington and Norinco 98 adapter, Winchester adapter, washer, Mossberg/Maverick 88 bolt, Remington bolt, Winchester bolt and comes with a free Shotforce Buttpad.